Celebrate the auspicious occasion of Diwali by sending this Fascinating Diwali Gift Tray to your friends and relatives. This tray includes with Three Pc Handmade Chocolates in Heart Shape Box,Five Pc Handmade Chocolates, Five Diyas, 750 ml Haldirams Thandai Bottle, Approx. 250 gram Haldirams Kaju Pista Roll, Approx. 250 gram Haldirams Soan Papdi, Approx. 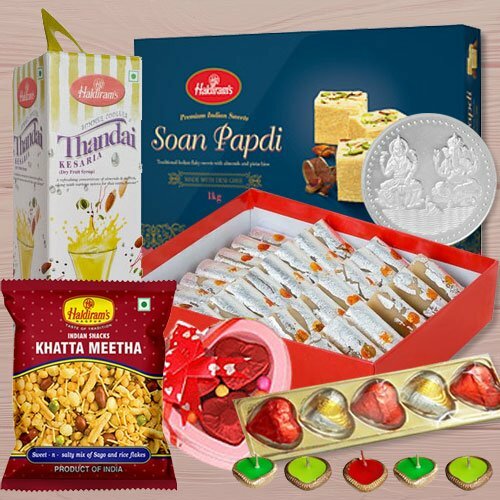 250 gram Haldirams Khatta Meetha Mixture and One Free Laxmi Ganesh Silver Plated Coin. Note: Tray design may change as per availability. Flowers Delivery Chittorgarh, Send sweets Tellicherri, Wedding Cake Ranchi, Diwali Mithai Cuttak, Send Flowers and Gifts to Belgaum, Online Shop Firozpur, Flower to Bhilai, New Year Flowers Taran Taran , Fresh Fruits Kanpur, Send Gift Shimla, Dry Fruits to Bokaro, Birthday Delivery Udaipur, Sending to Jodhpur, Flower shop Bilimora, Ghaziabad Online Cake Delivery.